The Digital Revolution is accelerating our access to knowledge and social media has revolutionized how we communicate. Businesses growth is often times grounded in quantifiable metrics and knowledge gained through erudition and professional designations. While a technical framework is required and fundamental to a successful career or business, we overlook the importance of what we can only measure qualitatively, including networking, leadership and respect. Success in life is a function of our interpersonal relationships. Networking is a learned skill and does not require the personality of an extrovert. A memorable introductory conversation and exchange of business cards will increase relationship capital after applying a process for patient and purposeful follow-up. Creating a network of trusted friends and colleagues, who will provide information, introductions, mentoring and partnership, will expand your personal and professional opportunity set. Results follow planning, practice, and commitment. An acute understanding of the intangibles or ‘soft skills’ is often required for nurturing new contact and developing a life-long friendship. While these intangible skills are taught and studied, their practice underpins the success of our most revered business, political, and humanitarian leaders in recent history. How does one quantify trust, communication, and emotional intelligence? The interdependence of our global economy places a premium on authenticity and relationships. • Develop proven strategies for building relationship capital. • Ensure a memorable introduction with your first impression. • Implement techniques for using social media to support and grow your network. • Use the internet to get off the internet. Following Sameer Somal’s presentation, please join in welcoming Beta Gamma Sigma Global Headquarters CEO, Chris Carosella, as she honors the 85th Anniversary of BGS-NYC. Chris is looking forward to meeting NYC Area members and receiving feedback on your membership experience and any ideas you have to add more lifetime value for BGS members. Sameer Somal is the Chief Financial Officer at Blue Ocean Global Technology and Blue Ocean Global Wealth. 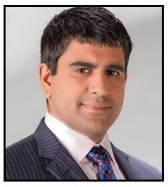 Prior to co-founding Blue Ocean Global Wealth, he was a Senior Investment Analyst at The Bank of Nova Scotia and a Financial Advisor and Intermediary at Morgan Stanley and Merrill Lynch & Co. As part of the Investment Strategy Group at The Bank of Nova Scotia, Sameer actively contributed to the firm’s white paper and institutional business development efforts. He delivered keynote presentations and fostered education partnerships nationally. His fiduciary responsibility at Ernst & Young and Advisor Compliance Associates include helping asset management and alternative investment companies adapt to Sarbanes-Oxley. Sameer is a CFA Charterholder, a CFP® professional, and a Chartered Alternative Investment AnalystSM. Sameer serves on the Financial Planning Association (FPA) National Diversity Committee and the Board of Directors of the Philadelphia/Tri-State FPA. A senior financial services leader on industry roundtable and panel discussions, Sameer serves on CFP Board’s Council on Education and is a Women’s Initiative (WIN) Advocate. He is an active member at CFA Institute, serves on the Advisory Executive Council of the Women Economic Forum (WEF), and is a Board Advisor at the iPlan Education Institute in New Delhi, India. A member of the Speakers’ Series at the Johns Hopkins University Carey School of Business, Sameer is a frequent speaker on the digital revolution, reputation management, succession planning, technology, diversity, financial planning, entrepreneurship, and leadership. In May of 2017, he was named an Iconic Leader Creating a Better World for All by the All Ladies League & Women Economic Forum.